Selsor Telecommunication Cables / Telephone Cables are used in Telephony Networks for low frequency signals supporting voice and low frequency data communications. They are used to connect campus networks, telephone central offices and apply to both an internal and external environment. Commonly ordered products within this category (focussed on UK Standards) are the CW1308, CW1128, CW1308B and CW1128/1198. 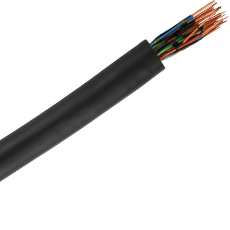 Selsor has available multiple configurations of Telecommunication Cables/ Telephone Cables covering paired and quad conductors, conductor size and type, insulation compounds, shielding options, drain wires, armouring and sheath/jacketing compounds. This means you can be sure of a cable that is suitable to your environmental conditions whilst delivering an optimal communication link. Selsor Telecommunication Cables / Telephone Cables conform to relevant industry standards and are supplied with the Selsor product warranty.